Life size Augustus Caesar statue illuminated at the entrance of the Caesar Palace Hotel and Casino, photographed at dusk, Las Vegas, Nevada. 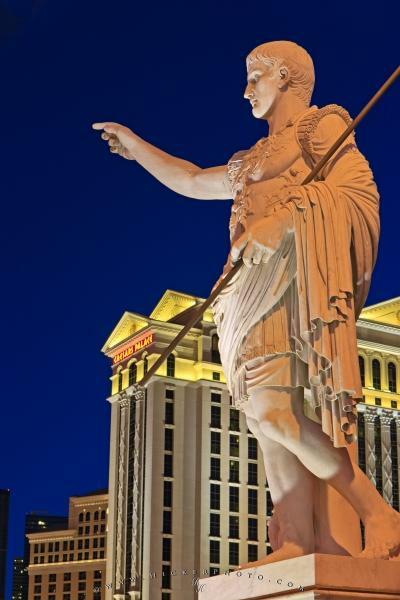 Visitors are greeted by a life size Augustus Caesar statue at the entrance of the Caesars Palace casino property in Las Vegas. I photographed this symbolic statue at dusk which is in general the best time to photograph cities, the mix of illuminated architectural features, artificially light mixed with the saturated blues of the twilight hardly ever fails for a great photograph. Photo of the Augustus Caesar statue in front of the Caesars Palace Hotel and Casino in Las Vegas.